Photo credit: Will Foster Photography. It should come as no surprise that we’re really into details. We obsess over the finer parts of service and food preparation because we know that doing so is one of the things that makes coming in to dine with us such a positive, welcoming experience. From the way we arrange our table settings, to the ingredients we use in every cocktail or dish, to the vendors and farmers we work with – these details matter to us, and they speak to what we’re all about. With this in mind, we want to shine a spotlight on one of our beloved vendors: Smith Teamaker. Based in Portland, Oregon, the artisan tea company was founded in 2009 by talented husband and wife duo Steven and Kim Smith. 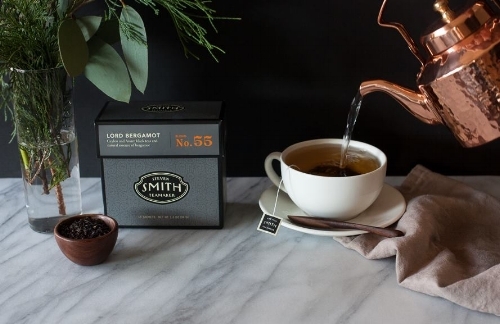 “The Smith name has grown to stand for uncommon quality, taste, and innovation in the Super Premium tea category,” the company explains, a nod to the decades of experience Steven Smith gained while succeeding in starting acclaimed tea companies Stash and Tazo. At Brimmer & Heeltap, we’re incredibly inspired by Steven and Kim Smith’s passion for tea and the attention to detail that Kim continues to employ in their business. We love serving their bold, delicious teas; The Lord Bergamot blend that we carry has been a particularly beautiful addition to the menu. Described by Smith as having “a flavor somewhat superior to traditional Earl Grey,” this offering is made with select teas from India’s Assam valley and scented with bergamot flavors from the Reggio Calabria region in Italy. Our current menu also contains their Brahmin, Mao Feng Shui, Jasmin Silver Tip, Peppermint, and Big Hibiscus flavors – teas that we enjoy drinking just as much as our guests do. For more information about this exceptional teamaker, visit Smith Teamaker online. And, be sure to stop in soon for brunch or dinner to try a cup of Smith tea for yourself.